The Pima Community College Women’s basketball team kept the ball rolling as the Aztecs defended their home court and improved to 2-0 in a 30-point blowout versus Arizona Christian University (108-78). The Aztecs started off great right from the start and opened the game on a 10-2 run. The Aztecs put in a team effort as they had six players score in double digits. 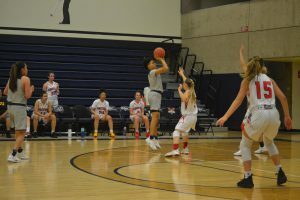 They were led again by Sophomore Jacqulynn Nakai for the second game in a row as she put up 23 points on 8-11 shooting to go along with 9 assists and 4 rebounds. 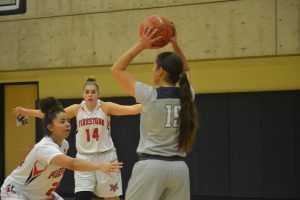 Fellow sophomore Brianna Pitre tacked on 16 and 6-10 shooting, and Shauna Bribiescas and Freshman Ryleigh Long chipped in 11 points each as the returning players led the way. 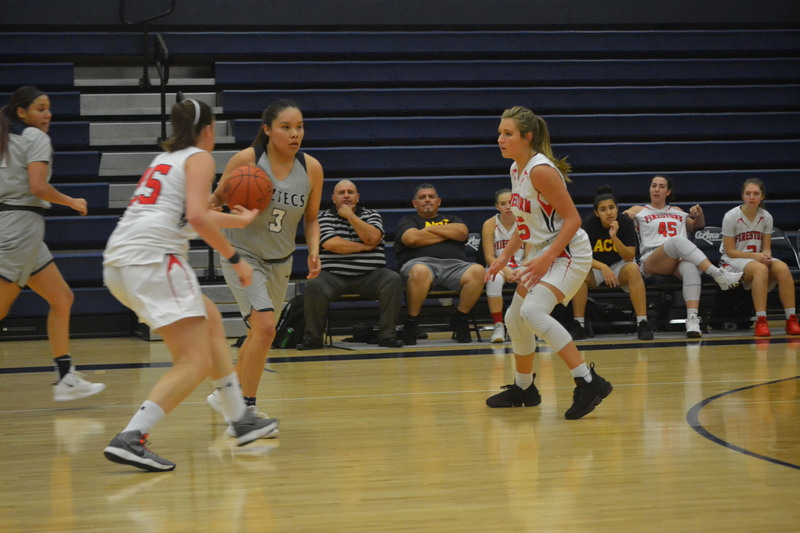 Freshman Alyssa Perez, for the second game in a row, did a little bit of everything, putting up 10 points, 7 assists and racking up 4 steals on defense. The Aztecs looked impressive, averaging 99.5 points in their first two games. The women return to action against Howard College 3 p.m. Nov. 15 in Thatcher as they compete in the Eastern Arizona Classic. The tournament runs from Nov. 15 to Nov. 17 in Thatcher, Arizona. Their first game is against Howard College at 3 p.m. Nov. 15. Pima started the season hot puting down the Antelopes, with a 29-point thrashing of Grand Canyon University 91-62 in its home opener. Nakai led the way with 20 points and racked up 9 assists and 3 steals. Bribiescas started the season with an impressive double-double, putting up 19 points on 8-9 shooting and pulling down 11 rebounds. Perez did a little bit of something on both ends of the ball as she finished with 6 points, 5 rebounds, 5 assists and 5 steals. And Freshman Haile Lawson pitched in 5 points and contributed with 9 rebounds.